I had seen this cake in the past and thought I would make it for my family for Easter. My family loves chocolate cake with peanut butter frosting so I thought that would be a good choice for this cake. I decided to make my favorite chocolate cake that I have baked for years. Now the recipe normally is for a 9″ x 13″ pan, but I baked it in two 9″ round pans. When the cake was done the center fell to about 1/2″. So I decided to bake the cake again this time doubling the recipe (1 1/2 batches would be perfect). The same thing happened but not quite as bad since I had more batter. Good thing I have the extra cake to level the layers. I am not sure what happened. I have used this recipe for years and it was my go-to cake back when I baked wedding cakes. It is a moist, rich chocolate cake. Anyway, I will give you the recipe and you can decide if you would like to try it. You could really make this cake using any flavor or even a bought cake. It could be fun trying different color/shaped peeps and other candies for the center. I iced my cake with Peanut butter frosting. 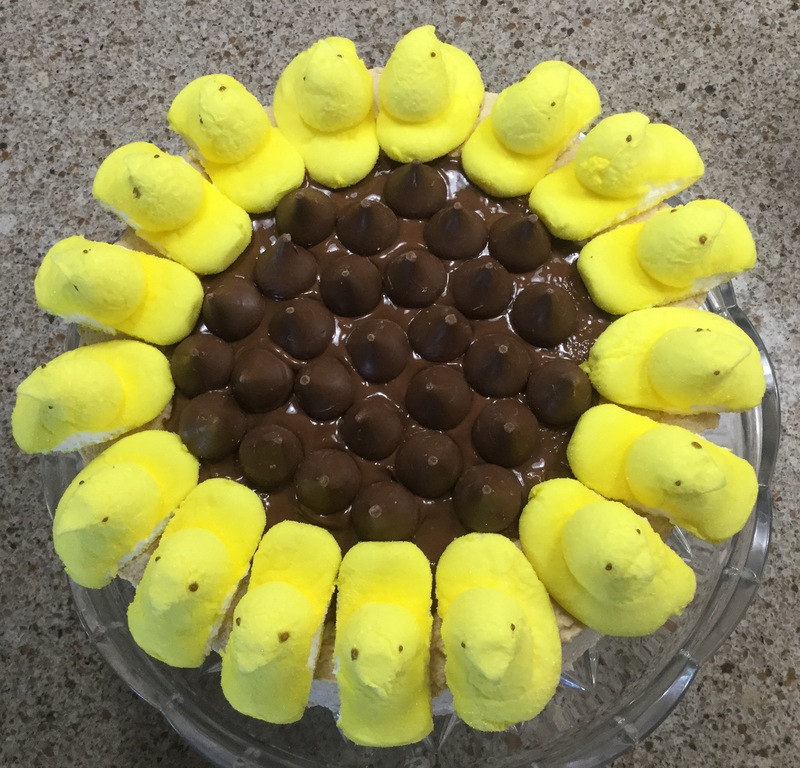 Basically you put peeps around the edges and chocolate kisses in the center of the cake. Since I used peanut butter icing I decided to melt a few kisses, let them cool slightly and spread them on the top center of the cake. I probably used about 15-20 kisses for this step. I then placed the peeps around the top edge of the cake with them extending slightly over the edge. I then placed the kisses in the center of the cake. After a rocky start I was pleased with the end results and hope my family enjoys the cake.